Shuttle service between Gabriola ferry terminal and event venues can be reserved free of charge to event participants. Please inquire the availability of the shuttle service at the time of registration. The Science of Climate. The Opportunities for Change. Join us for a morning of presentations on the science of climate change, and the challenge and opportunities for taking action, followed by a panel discussion on a series of local initiatives. Dr. Jeff Lewis is a faculty member in the Geography Department at Vancouver Island University (VIU), where he teaches earth and atmospheric sciences. Jeff has expertise working with large- scale climate models used to predict past and future climatic trends. He is also a faculty mentor for the Awareness of Climate change through Education and Research (ACER) project, a university based initiative to promote a greater understanding of the science and social implications of climate change to students and the general public throughout Vancouver Island and coastal BC. Sara Muir Owen has Bachelor of Science in Agriculture and a Master of Landscape Architecture from the University of British Columbia (UBC), and is a registered professional planner with the Canadian Institute of Planners. She has over a dozen years of experience in sustainable community planning and design in both Canada and the US, and has managed numerous award winning projects recognized by the American Planning Association, American Society of Landscape Architects and the Canadian Institute of Planners. In 2010, Sara joined the Pacific Institute for Climate Solutions (PICS) at UBC where she manages multidisciplinary, multi-partnership research, programs and events aimed at developing climate change solutions for British Columbia and beyond. Addresses will be given upon registration. 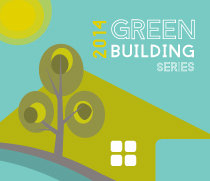 This house is one of the few in the region that achieved Built Green Platinum Certification. It is carefully designed to take advantage of the site and the orientation in order to minimize energy load and provide comfort and view to the ocean. Energy efficiency measures include highly insulated envelope, high-efficiency heat recovery ventilator, air-to-water heat pump, LED lighting and energy star rated appliances throughout. This home is also fully wired and ready for installation of solar photovoltaic panels. Materials with high percentage of recycled content were selected including tiles, drywall, insulation, concrete and honeycombed gravel stabilizer panels in the permeable driveway. The house is equipped with a 9,000 liter rain water harvesting system. What's also unique is the state-of-the-art waste water treatment system that turns all waste water generated in the house into a clear and odorless filtrate. 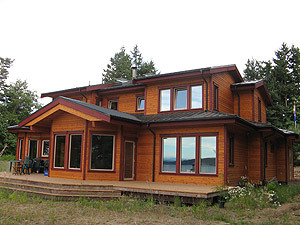 This moderate sized home (2200 ft2) was completed in 2013 with a focus on energy efficiency, low maintenance and the use of reclaimed materials. It is a hybrid home which blends timber frame construction and the use of structural insulated panels (SIPs) with traditional stick frame. Considerable time and effort was put into locally sourcing reclaimed materials including finishing lumber, doors, plumbing and lighting fixtures. The home also features radiant heat concrete floors, an air-source heat pump, a heat recovery ventilation system (HRV), passive solar design with deep overhangs, untreated cedar shingle exterior, metal roof, and an extremely efficient masonry wood stove. As the owners are avid gardeners, landscaping features include a substantial garden featuring raised vegetable beds, fruit trees, berries and an extensive collection of ornamental shrubs and trees. Two friendly cats patrol the yard. The Bramble is a retrofitted 750 sq.ft. 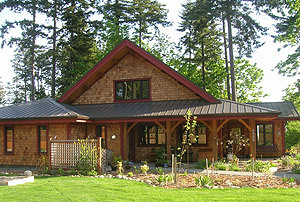 cedar home located on Thistledown Farm, a 20-acre organic farm on agricultural land reserve. 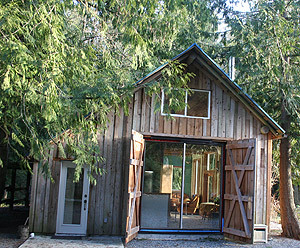 The renovation was carried out within the original structure, complete with big barn doors, which were all built from cedar wood and fir sustainably logged from the property. Trees were milled on-site for structural posts, board and batten and the planks that cover the ceiling. As much as possible, windows, doors, fixtures and cabinets were recycled or purchased from Habitat for Humanity. This major conversion saw all exterior walls removed, rain-screened and then rebuilt, with the huge hand-hewn main posts and beams retained in place along with the tin corrugated roofing. Fully insulated and air-tight, the woodstove provides heating while the ceiling fan, and operable windows help meet heating and cooling needs. Large south-facing window invite light and passive solar gain when needed. 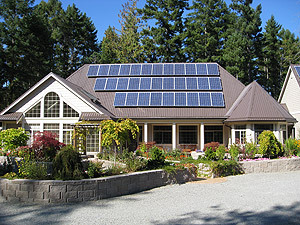 As a retired scientist and specialist in solar photovoltaic research and development, the owner of this property installed what could be the largest residential solar power system in our region - a 19.5 kW solar power system on the roofs of their house and garage/shop. The owners will be happy to share their knowledge in both solar thermal and power technologies and their whole experience of planning, installing and living with their solar system. 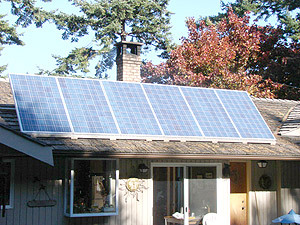 The owner of this property installed a renewable energy system that includes 6 roof-top solar panels and a micro wind turbine. The system is connected to a battery bank and is intended to provide an alternative source of energy for radio equipment in the event of a natural disaster, as the owner is a member of an emergency communications team.